Well it’s Halloween (and how appropriate — this is my 13th blog post! ), so I’ve been trying to think of a seasonally appropriate structural engineering topic for this week’s CloudCalc blog. In order to get inspiration, I walked down my street looking at the decorations on the neighborhood houses. A Jack o’ Lantern? No, that’s not a good representative, since after a few days they typically become so mushy that they can’t even support themselves. There’s a ghost – or actually a sheet of white plastic hanging from a tree. The best engineering analogy that brought to mind was Tyvek wrap covering a half-built structure. Over there, a couple of witches…probably not, a blog on aerospace engineering might be a better place to discuss women who manage to get broomsticks to fly. Then I turned the corner and spied an omnipresent symbol of Halloween – one which may just happen to be nature’s greatest structural engineer. Yes, I’m talking about the spider. It is well known that spider silk is one of the strongest materials on earth – pound for pound, stronger than Kevlar, and five times as strong as steel. Materials engineers have long been trying to produce a commercial material that can approach its properties (one recent step forward occurred when biologists managed to genetically modify a goat to produce spider silk in its milk). However, recent research at MIT and Stanford has yielded surprising new discoveries regarding both the engineering properties of spider silk, as well as the structural design of the spider’s web itself. Some of these discoveries are even influencing engineers’ thinking on how buildings should be designed. The first new discovery relates to the unusual non-linear behavior of the spider silk material under load. Whereas steel has three discernible behavior zones on its yield curve – 1) largely linear behavior adhering to Hooke’s law, 2) yielding, and 3) rupture – spider silk has four. With initial load, first comes initial stiffening, followed by a softening where the silk absorbs the stress through stretching. 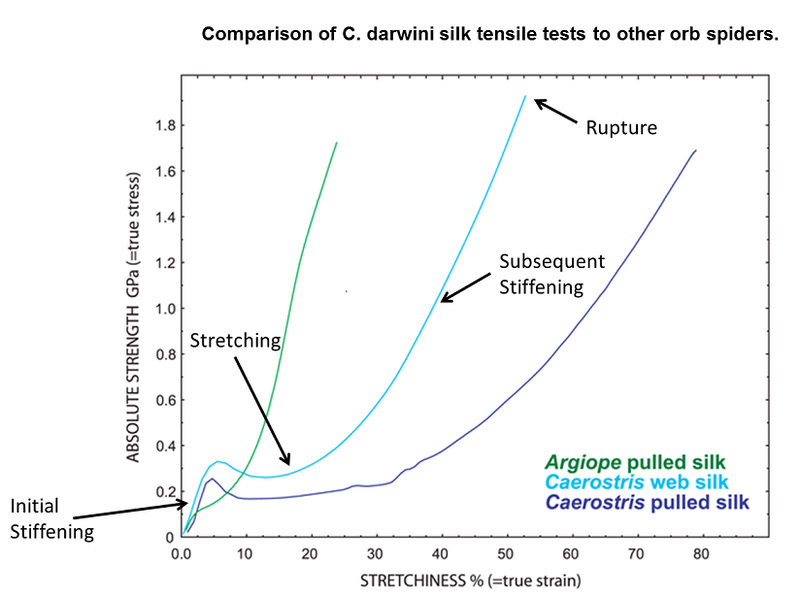 As the load increases, the silk stiffens sharply again, causing stress to spike locally, leading to the fourth behavior — crystalline structures within the silk suddenly rupture under the stress spike. Examining the web structure component by component also yielded interesting discoveries. Measuring the strength of individual threads, it is apparent that the spider has the capability of varying the material properties of each thread and joint (this is done by adjusting parameters such as the spinning speed, or the time of day/temperature at which the web is built, or the water content of the silk). So radial threads are made stronger, since they tend to provide the prime support to the entire web structure. Spiral threads – and selected joints – are made weaker in order to further promote localized failure, so overloads don’t bring down the whole web. This is similar to the way that a process engineer might add a frangible joint to the roof of an oil tanks or a rupture disk to a pipeline as a way of inducing sacrificial failure in order to prevent failure of the entire system. Spiders have also developed one more ingenious design skill. Whether it is due to the geometric pattern of the web, or stress stiffening in the silk (scientist still don’t understand how this works) overall strength of the web has been found to increase by 3-10% following the occurrence of damage due to localized failures! To me this seems very similar to the practice of alloying metals, where the metallurgist introduces defects into the material’s crystal lattice in order to increase the metal’s strength and other beneficial material properties. So now structural engineers are looking beyond just the silk material to learn design lessons from the spider web. Under discussion is the philosophy of preventing total collapse by allowing local failure and whether it deserves a place in the design of buildings, especially as it relates to seismic design. Scientists are also trying to study how a structure might increase in strength following damage induced by local failure. These are two issues that certainly might someday influence the engineering building codes. So the next time you walk through your neighborhood around Halloween, keep your eyes out for the spider and web decorations – you can potentially learn a lot of engineering from them. Although it might be a lot more fun to learn how those witches make the broomsticks fly. To read more on the engineering behind spider webs, go to http://newsoffice.mit.edu/2012/spider-web-strength-0202 and http://engineering.stanford.edu/news/stanford-researcher-sheds-new-light-mysteries-spider-silk. Need a structure built? Hire a spider. 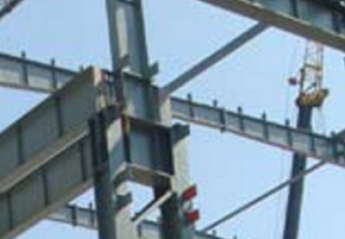 If you can’t, then consider using CloudCalc: www.cloudcalc.com – Structural Analysis on the Cloud.